During roughly the last decade and a half nearly 75 percent of the Iraqi Christian population fled the country. The site Faithwire reports that since 2003, the Christian population in Iraq has dropped dramatically. The number of Christians living in the country now stands at between 500,000 and 850,000. This means that over the past 14 years, some 1.5 million Christians have emigrated to other countries. Experts say that the Christian departure has sped up since the rise of ISIS. In Jerusalem, Westerners ask where the Church of the Holy Sepulchre is, but Eastern Christians know it as the Church of the Resurrection. Some Christians stop at the cross, at Jesus bearing the sins of the whole world. Others go through the cross, the empty tomb and emerge surprised, seeing the old world lived in differently with new colour and joy. I want to be an Eastern Christian in Jerusalem, to live in the light of the resurrection. Easter is not possible without having first gone through Good Friday and Empty Saturday; but, if we stop at Good Friday, we have believed the lies of the old world that death has the final word. We must move on to be the Church of the Resurrection – confident to live as Easter People with ‘resurrection’ as our cry. A new report on global Christianity says that people of other faiths in northern Europe have less personal contact with Christians than agnostics and atheists. Christianity in its Global Context, 1970-2020 a report produced by the Center for the Study of Global Christianity at Gordon-Conwell Theological Seminary in Massachusetts, says that 82% of people in northern Europe have personal contact with a Christian. If you remove agnostics and atheists from the figures this drops to 21%. Globally the report found that Muslims have less contact with Christians than Jews. A global study of religious adherence released on Tuesday by the Pew Research Center found that about one of every six people worldwide has no religious affiliation. This makes the “unaffiliated,” as the study calls them, the third-largest group worldwide, with 16 percent of the global population — about equal to Catholics. The study also found a wide disparity in the median age of religious populations, with Muslims and Hindus the youngest, and Buddhists and Jews the oldest. The median age of the youngest group, Muslims, was 23, while the median for Jews was 36. Over all, Christians (including Catholics) are the largest religious group, with 2.2 billion people, about 32 percent of the world’s population. They are followed by Muslims, with 1.6 billion, about 23 percent. There are about one billion Hindus, about 15 percent of the global population, and nearly half a billion Buddhists, about 7 percent. 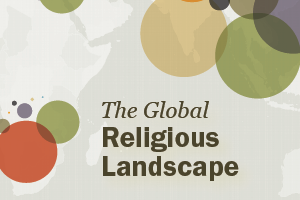 The study, “The Global Religious Landscape,” is a snapshot of the size and distribution of religious groups as of 2010, and does not show trends over time. More than three-quarters of the religiously unaffiliated live in Asia, the majority in China. Many of the people in this group do hold some religious or spiritual beliefs and may even believe in a deity, but they do not identify with a particular faith. The study is based on analysis of 2,500 different data sources, including censuses and demographic surveys of children and adults in 232 countries. It relies on self-identification, so it includes people who are not regular practitioners or orthodox believers of the religion they claim.